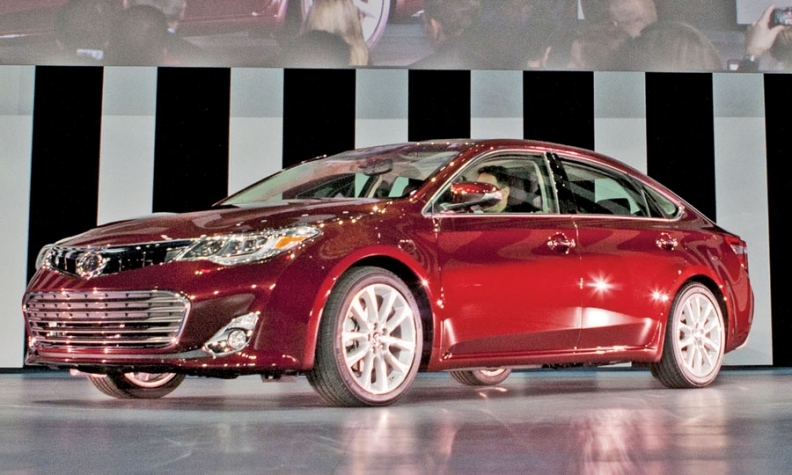 The U.S.-developed 2013 Avalon won raves when it was unveiled this spring in New York. An unexpected showdown over the redesign of the Toyota Avalon became a test of Toyota's professed intent to move more decision-making power away from Japan and entrust it to U.S. engineers. Takeshi Uchiyamada, Toyota Motor Corp.'s global r&d chief and the premier champion of regionalized product development, made sure the company followed through with his plan to decentralize decision making. Toyota executives from Japan and the United States were gathered to review competing clay-model designs for the 2013 Avalon sedan. A somewhat conservative design came from Japan. Another less conservative one was penned by Toyota's Calty design studio in southern California. Opinions, not surprisingly, fell along lines of nationality. "There was a clear bias toward the Japanese preferring the more conservative design and the Americans preferring the much more aggressive California design," recounts Jeffrey Liker, an engineering professor at the University of Michigan who has written six books about the Toyota Production System and was briefed on the design meeting. Chief engineer Randy Stephens, who was selected in 2009 with two other Americans to be the company's first non-Japanese chief engineers, was supposed to make the call. It was a sensitive issue, and Stephens didn't want to cross his bosses from Japan. Steve St. Angelo, who oversees all North American manufacturing and production engineering, says that's when Uchiyamada stepped in. "There were differences of opinion, but Uchiyamada-san requested that the North American executives be trusted on this issue because we are closer to the North American customer," St. Angelo says. "As a result, we utilized TMC input without compromising the voice of the customer. Ultimately we got a fantastic new car." And so Stephens went ahead with the Calty design -- with its speedback styling, swoopy character lines and dramatic gap-mouthed grille. It won raves when unveiled at the New York auto show this spring. The story underscores Toyota's efforts to move the center of gravity closer to the market -- especially in North America, where local executives had complained that their voices were not being heard. After the recall crisis of 2009-10, Uchiyamada made giving them more authority a top priority. The only hitch was making the policy stick. Liker calls the Avalon design meeting a pivotal moment: "Uchiyamada was sending the message: I realize you are the first American chief engineer and always worked for a Japanese chief engineer, but now you are in charge and must decide what is best for the American customer."